I have a project that has some "Click here to hear feedback" links, so when they click 'here', the audio plays. Initially, we had the audio on the base layer with a trigger to play the audio on click. However, the base layer seekbar wouldn't associate with the audio being played (e.g. you couldn't see it progressing as the audio progressed). What they wanted was to add the audio to a new layer, so I did that. It works great for seekbar functionality, but if you pause and then hit the replay button, you get dead air. When it should really replay. I now have one slide working, but can't seem to get the second slide (of about 10 affected slides) working...despite using the same settings as the working slide. HELP! I feel like I'm going nuts. Additionally, the play/pause functionality is a bit wonky after the audio layer has played through, but I feel that might be a bug. I'm not sure. HELP! Please! Or send more coffee. Only thing I can think might be causing the problem is the Audio Play trigger. 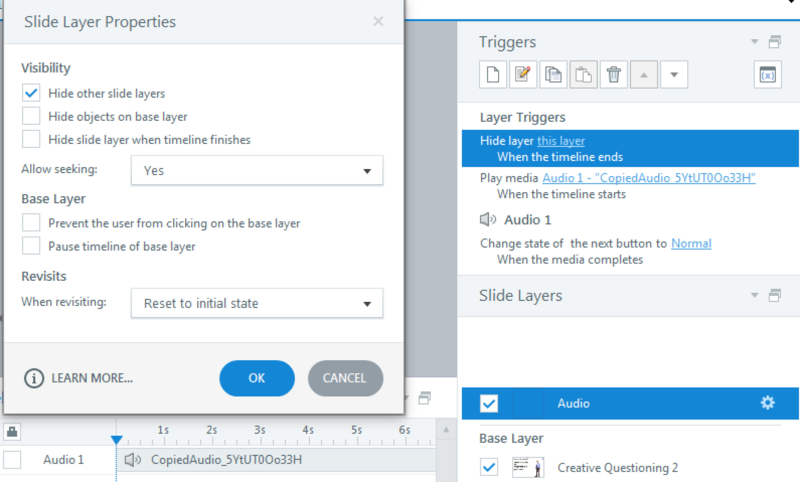 When I add media to a layer or base layer, I just use the timeline start (where it's dropped) as the sync point for starting the audio. 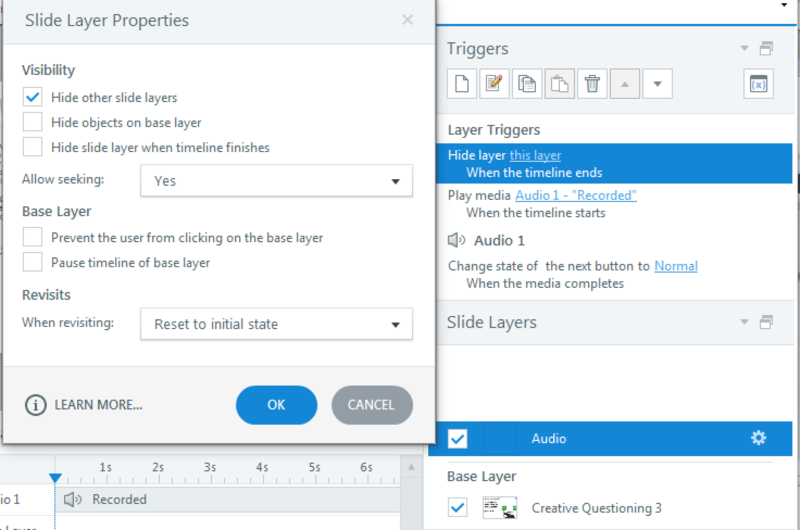 In this case, I'd also use a When timeline ends event for the layer in place of the when media completes. I'm thinking the audio play trigger is disconnecting the media from the actual timeline and messing up the reset. So...this is an odd one (at least to me), but I got to the bottom of the issue. The audio files on the layers were cut and pasted from the base layer. Which is why they wouldn't play on their own with the timeline, thus the Play Media at Timeline Start trigger. However, when I deleted that trigger (after saving and reopening the file), the 'copied' audio file changed. So instead of just saying "copied324348423" or whatever on the timeline item, it changed to the audio waves, as audio usually looks when you add to the timeline (if that makes any sense). And then, the audio magically played on the replay. I will say that now, once you play the file entirely, and then replay, the pause button 'disappears'. You can pause whenever you click on the seekbar, and then it 'appears' again, but otherwise it just looks like Play is your only option. Something is definitely buggy, but it appears as though the cut from base layer, paste to new layer for the audio file was what triggered the issue. This sounds a lot like something I ran into the other day in terms of the replay button not functioning as intended. 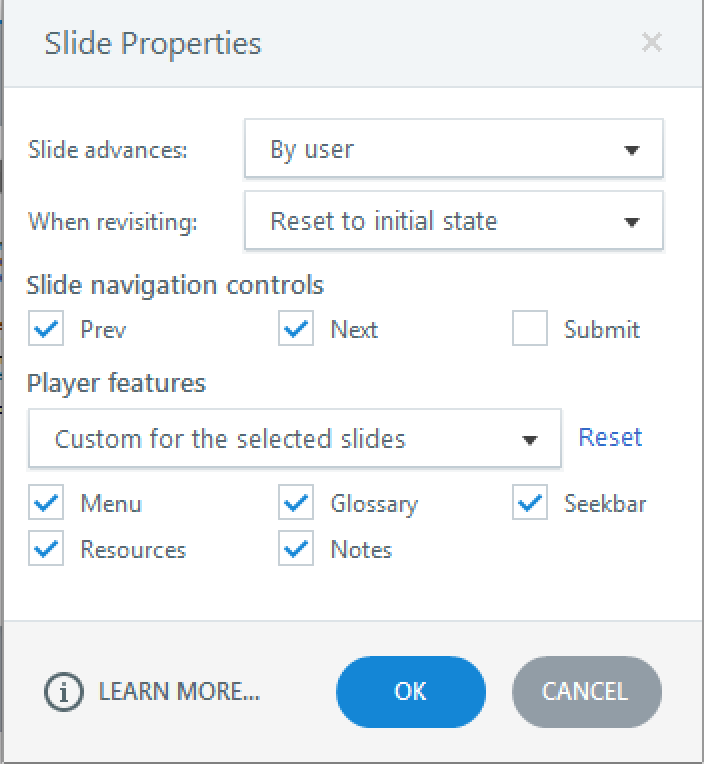 In our case, the replay button was only controlling slide layers and not replaying the entire slide. What I found was the Base Layer settings in the Layer Properties pane were changing what the Replay button was controlling. 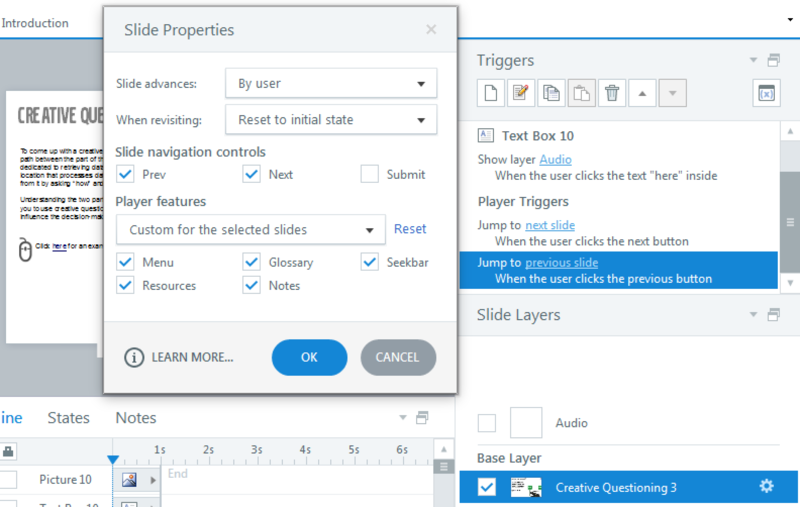 In our example, both "Prevent the user from clicking..." and "Pause timeline on base layer" were selected. When I deselected both, the Replay button controlled the base layer as desired. It should be noted that in this case, these were slides that have interactive elements on them. It's my understanding that this wasn't a bug, but just a case of unclear, yet intentional, functionality. I didn't look further into which setting, or if it was both, was setting the replay button to control the layer, but perhaps this would fix the issue you've experience Ashley and alleviate the need for triggers. I'd look into Michael's thoughts as well - as the layer replaying is controlled by those slide layer properties you've set in terms of allowing for seeking, or pausing the base layer. If you're still running into issues, I think we'll want to know the steps you went through in terms of setting up the audio, copying and so on - and likely if you had a sample file that would be the best step. You can share it here or send it along to our team here. Thanks Ashley for the update and glad you were able to figure it out.